Ages 8 through 17. 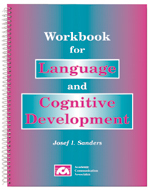 The reproducible worksheets in this book can be used to stimulate the development of expressive language and critical thinking skills as students associate concepts, classify items, and solve problems. The activities range in difficulty from simple to complex. The more difficult tasks often have more than one possible solution. Students are required to use a variety of thinking strategies and to explain their answers. Classification Worksheets. Students are asked to classify items and to compare items in terms of similarities and differences. Association Worksheets. Students are asked to identify items that belong together and to describe how these items are associated. Problem Solving Worksheets. Students are challenged to make use of various types of verbal reasoning strategies to solve problems. Skill in classification and association strategies is required for the successful completion of many of the lessons. Pictorial Absurdity Worksheets. Each worksheet includes pictures of two absurd situations. The student's task is to identify what is wrong in each of the pictures. Maze and Puzzle Worksheets. Students are challenged to find their way out of mazes and to complete complex puzzles. Students must pay close attention to instructions and to visual details to complete these tasks.